Alzheimer's patients frequently suffer from sleep disorders, mostly even before they become forgetful. Furthermore, it is known that sleep plays a very important role in memory formation. Researchers from the Technical University of Munich (TUM) have now been able to show for the first time how the pathological changes in the brain act on the information-storing processes during sleep. Using animal models, they were able to decode the exact mechanism and alleviate the impairment with medicinal agents. The sleep slow waves, also known as slow oscillations, which our brain generates at night, have a particular role in consolidating what we have learned and in shifting memories into long-term storage. These waves are formed via a network of nerve cells in the brain's cortex, and then spread out into other parts of the brain, such as the hippocampus. "These waves are a kind of signal through which these areas of the brain send mutual confirmation to say 'I am ready, the exchange of information can go ahead'. Therefore, there is a high degree of coherence between very distant nerve cell networks during sleep", explains Dr. Dr. Marc Aurel Busche, scientist at the Department of Psychiatry and Psychotherapy at TUM University Hospital Klinikum rechts der Isar and TUM Institute of Neuroscience. Together with Prof. Dr. Arthur Konnerth from the Institute of Neuroscience, he headed the study which was published in the journal Nature Neuroscience. As the researchers discovered, this coherence process is disrupted in Alzheimer's disease. 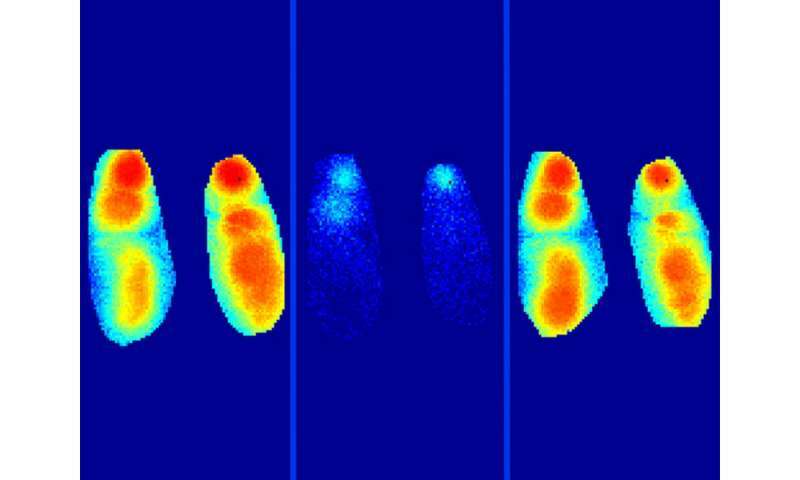 In their study, they used mouse models with which the defects in the brains of Alzheimer's patients can be simulated. The animals form the same protein deposits, known as β-amyloid plaques, which are also visible in human patients. The scientists were now able to show that these plaques directly impair the slow wave activity. "The slow oscillations do still occur, but they are no longer able to spread properly - as a result, the signal for the information cross-check is absent in the corresponding regions of the brain," is how Marc Aurel Busche summarizes it. Busche and his team used this knowledge to treat the defect with medication. One group of sleep-inducing drugs, the benzodiazepines, is known to boost inhibitory influences in the brain. If the scientists gave small amounts of this sleep medication to the mice (approximately one-tenth of the standard dose), the sleep slow waves were able to spread out correctly again. In subsequent behavioral experiments, they were able to demonstrate that learning performance had now improved as well. For the researchers, of course, these results are just a first step on the way to a suitable treatment of Alzheimer's disease. "But, these findings are of great interest for two reasons: firstly, mice and humans have the same sleep oscillations in the brain - the results are thus transferrable. Secondly, these waves can be recorded with a standard EEG monitor, so that any impairment may also be diagnosed at an early stage", concludes the scientist. "THC blocks an enzyme called acetylcholinesterase, which speeds the formation of amyloid plaque in the brains of people with Alzheimer's disease. The Alzheimer's drugs Aricept and Cognex work by blocking acetylcholinesterase. When tested at double the concentration of THC, Aricept blocked plaque formation only 22% as well as THC, and Cognex blocked plaque formation only 7% as well as THC." From "Marijuana May Slow Alzheimer's" WebMD. Based on the study, "A Molecular Link between the Active Component of Marijuana and Alzheimer's Disease Pathology" – full study available free at PubMed. "The activation of cannabinoid CB2 receptors stimulates in situ and in vitro beta-amyloid removal by human macrophages" and "Activation of the CB(2) receptor system reverses amyloid-induced memory deficiency" (both at PubMed).